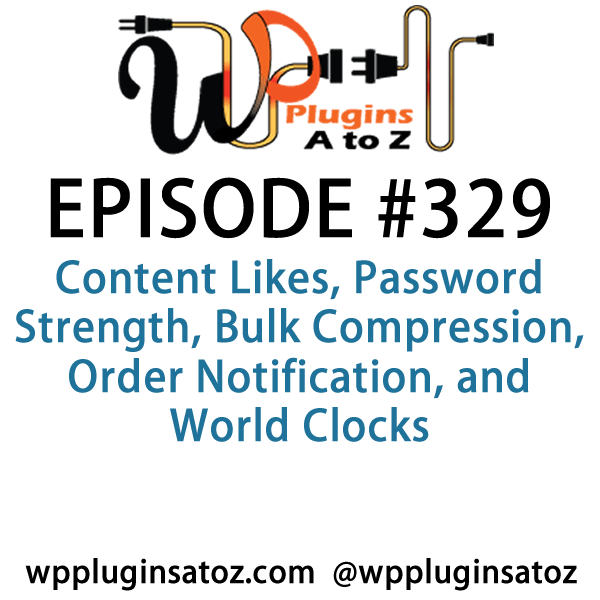 It's Episode 329 and we've got plugins for Content Likes, Password Strength, Bulk Compression, Order Notification, and World Clocks. It's all coming up on WordPress Plugins A-Z! Currently in beta but ready for you to check out. You can down load the plugin from their website for testing on your site. So far my test have found that this third party service is very easy to use and setup an account. Installation of the plugin goes quite smoothly after you install the plugin you signup while in the back-end of your site and they send you an activation email with access to your API key. Once installed simple go to Media Menu and find the “Bulk Compress” Item and simply click to get started. I used this on my main site where I had already used EWW and smash-it and found that it did indeed compress images further saving me more space and speed on the site. I will be James interviewing the developer soon to talk more about the plugin. Enables a simple like/unlike feature to be added to posts, pages, etc. There is no dislike feature. You are expected to style it however you like so it matches your theme; as it has none of its own CSS. There are also no admin page or options for this plugin. It does work, but you have to hold it's hand to make it work properly. With Today's Internet Finding quality WordPress Hosting and support can be a challenge, drop that stress by contacting JohnOverall.com web services. I can help you eliminate your WordPress your stress. Solving your WordPress Emergency issues or doing the more day to day items such as finding that perfect plugin, helping you move to a new hosting provider or even provinding Quality WordPress hosting. 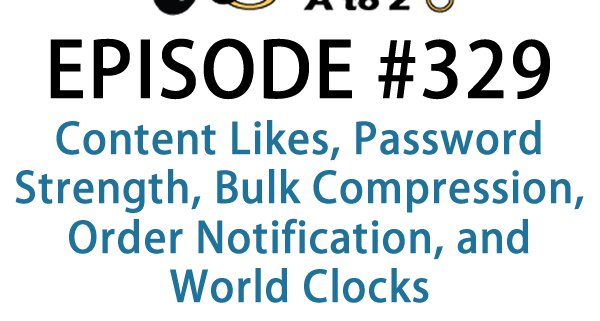 Anyone listening to this show has a passion for WordPress. Want to write about something unique within WordPress? I'm now the WordPress Editor for Smashing Magazine, one of the biggest web design resources online. I'm looking for folks to write great articles about WordPress. Get a lot of exposure to yourself and your work. Visit http://marcuscouch.com/smashing and I'll reply back with more info. It's a great opportunity to contribute to the WordPress community, get exposure and get a few hundred bucks for the effort too. This is something of a niche plugin but if you do any business in London you might consider this plugin. It was created to help you sell tickets to the London theatre scene. You can become a partner and earn commissions on ticket sales to shows in London. This is a pretty easy plugin to get up and running and uses both a widget and short code builder to help you display tickets for sale. You import the data for local theatres setup a widget and or short code to display what your wanting to promote and start earning a commission. You will need to sign up as a partner but the process looks easy enough. The plugin is free, and users earn good commission on all referred sales. There are multiple partnership options, either directly through London Theatre Direct or via their AWIN programme. The plugin is directed at businesses who want to add a new revenue stream, and bloggers, reviews and individuals who want an easy way to monetize their posts. Receive a SMS when a new order is placed on your site. The plugin hooks into wooCommerce and the Twilio SMS service to send you a message with the order details. You will need a twilio SID and auth token, plus a twilio number to use this plugin. This donation is on behalf of Innate Life Chiropractic, www.innatelife.com.au a Jezweb built WordPress website for a chiropractor in Lake Macquarie, Australia. If you are in need of a simple way to find your local time and the time in a particular time zone this plugin may be of some help. It is simple in that you just activate and enter short code on page. The when viewed you simply choose the time zone for what your looking for. It is very limited but could be of use. Improvement could be allow for multiple instances and comparing time zone. WooCommerce minimum password strength can be set to Very Weak, Weak, Medium or Strong. A setting of Very Weak will also disable the strength meter used on WooCommerce pages.